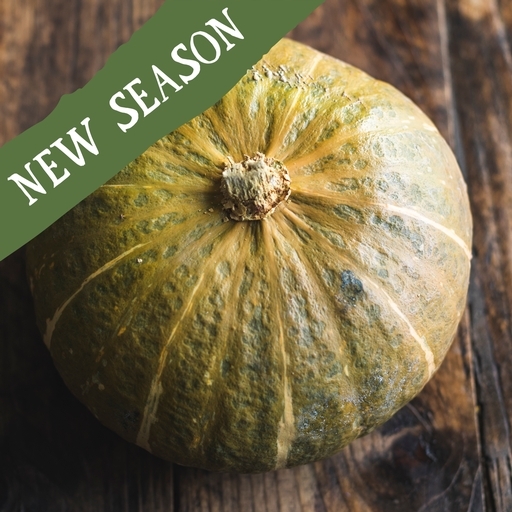 This round, dark green squash hides glorious yellow flesh that lives up to the sweetness of its name. Halve and roast to honeyed tenderness, then eat with butter for winter comfort. Sweet Mama’s curvaceous shape also makes it a prime candidate for stuffing. Roasting squash gives a dish of glorious colours and deep, sweet flavours. Good as a starter, drizzled with yoghurt and chilli oil; as a side, mashed with nutmeg, salt and butter; or stirred into risotto just before the rice is cooked. Alternatively, stuff and bake whole, or simmer in hearty stews, curries and soups as a flavourful, toothsome alternative to meat. Delivered from our farm, so wash before cooking. Keep warm and dry and this will last for many weeks.